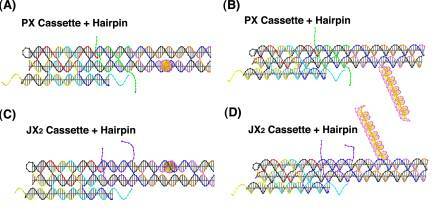 This cassette inserts PX-JX2 device into a 2D DNA crystalline arrangement. The cassette is shown in below. There are three parts to the cassette:  the insertion domain, which is at the bottom and shorter than the other two domains;  the control section, which is the device; and  an arm which indicates the state of the device. (A) and (C) below are views of the cassette perpendicular to it, and (B) and (D) are oblique views, emphasizing the reporter arm. (A) and (B) are in the PX state, and (C) and (D) are in the JX2 state. Shown below is the way in which the cassette fits into an array containing eight different triple crossover molecules tiles. In addition, it contains a marker tile, to indicate which way the reporter arm is pointing. The marker tile is shown in black. In the PX state, the reporter arm points towards the marker tile, and in the JX2 state, the reporter arm points away from the marker tile. AFM images of the two states are shown below. Both transitions are shown, PX going to JX2 above and JX2 going to PX below. 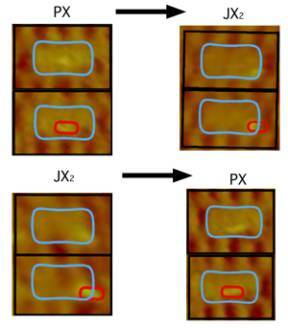 In each box are two images of a unit cell repeat of the array. The upper unit cell contains a blue outline that contains the cassette and the marker tile. The reporter arm is visible as a bright spot. It is in the middle in the PX state, and off to the right in the JX2 state. The reporter arm has been outlined in red in the lower unit cell.